Oscar Rodriguez has always been a storyteller. He doesn’t tell stories in a traditional way, though. As a student in the Virtual Technology and Design Program in the University of Idaho College of Art and Architecture, Rodriguez, 21, uses virtual tools, such as 3-D modeling software, Photoshop and other design technologies, to make a story come to life. As a child, Rodriguez, who is from Jerome, Idaho, loved films and wanted to learn how he could create his own. He found his way to virtual technology and design during a visit to campus, before he became a student of the university. “When I heard about this major, I just remember feeling like ‘Yeah, I feel like I should be here, you know? This is the place for me,’” he says. Now, being immersed in it, he’s found that his major is full of possibilities. One of his current projects is an online game designed to educate people on the effects salmon have on the ecosystem. Another project he worked on involved augmented reality, which simulates an image in the real world on a device, like a smartphone, through a camera. Rodriguez, alongside his friend Kyle Weage, created a pop-up book that used special symbols on the pages of a physical book to activate virtual pop-ups. Rodriguez says students in his program can apply what they’ve learned and the tools they’ve become familiar with not only to create designs, stories and games, but also to use their knowledge for more practical applications, such as medical simulations or architectural design. The need for Rodriguez’s kind of work spans different fields and has many applications — especially in a world where jobs are changing as technology changes the world. Not only is his work widely applicable, it has a lot to teach him, too. His work is also designed to teach others, which means he learns about topics outside his major. Rodriguez’s work focuses much on teaching, learning and reaching other people, and he believes the best way of doing this is telling stories. 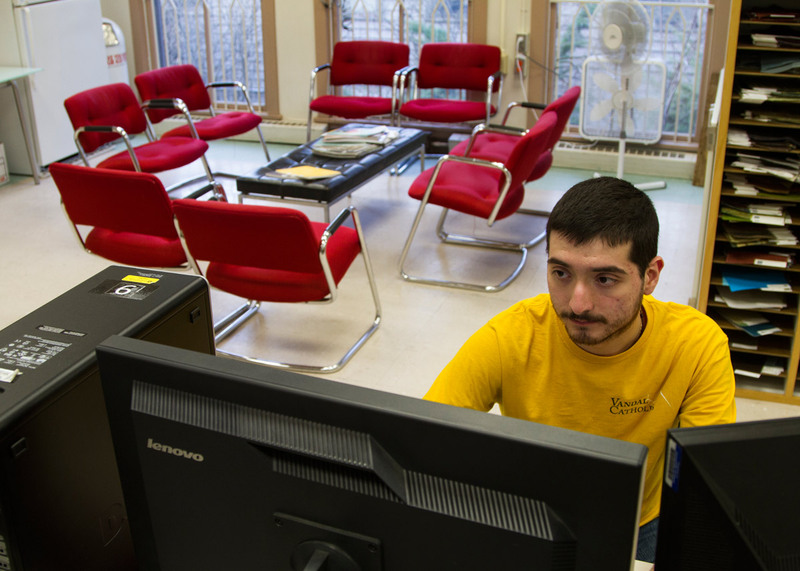 Oscar Rodriguez works on his virtual technology and design project. Photographer: Kira Hunter, from Emmett, is a junior majoring in biology and minoring in professional writing. She plans to enter the science field as either a scientific writer, GMO lawyer or genetic counselor.